Not to be confused with Galicia (Eastern Europe). Galicia (/ɡəˈlɪʃ(i)ə/; Galician: Galicia [ɡaˈliθjɐ], Galiza [ɡaˈliθɐ];[a] Spanish: Galicia; Portuguese: Galiza) is an autonomous community of Spain and historic nationality under Spanish law. Located in the north-west of the Iberian Peninsula, it comprises the provinces of A Coruña, Lugo, Ourense and Pontevedra, being bordered by Portugal (Braga District, Bragança District, Viana do Castelo District and Vila Real District) to the south, the Spanish autonomous communities of Castile and León and Asturias to the east, the Atlantic Ocean to the west, and the Cantabrian Sea to the north. It had a population of 2,718,525 in 2016 and has a total area of 29,574 km2 (11,419 sq mi). Galicia has over 1,660 km (1,030 mi) of coastline, including its offshore islands and islets, among them Cíes Islands, Ons, Sálvora, Cortegada, and—the largest and most populated—A Illa de Arousa. The area now called Galicia was first inhabited by humans during the Middle Paleolithic period, and it takes its name from the Gallaeci, the Celtic people living north of the Douro River during the last millennium BC, in a region largely coincidental with that of the Iron Age local Castro culture. Galicia was incorporated into the Roman Empire at the end of the Cantabrian Wars in 19 BC, and was made a Roman province in the 3rd century AD. In 410, the Germanic Suebi established a kingdom with its capital in Braga (Portugal); this kingdom was incorporated into that of the Visigoths in 585. In 711, the Islamic Umayyad Caliphate invaded the Iberian Peninsula conquering the Visigoth kingdom of Hispania by 718, but soon Galicia was incorporated into the Christian kingdom of Asturias by 740. During the Middle Ages, the kingdom of Galicia was occasionally ruled by its own kings, but most of the time it was leagued to the kingdom of Leon and later to that of Castile, while maintaining its own legal and customary practices and culture. From the 13th century on, the kings of Castile, as kings of Galicia, appointed an Adiantado-mór, whose attributions passed to the Governor and Captain General of the Kingdom of Galiza from the last years of the 15th century. The Governor also presided the Real Audiencia do Reino de Galicia, a royal tribunal and government body. From the 16th century, the representation and voice of the kingdom was held by an assembly of deputies and representatives of the cities of the kingdom, the Cortes or Junta of the Kingdom of Galicia. This institution was forcibly discontinued in 1833 when the kingdom was divided into four administrative provinces with no legal mutual links. During the 19th and 20th centuries, demand grew for self-government and for the recognition of the culture of Galicia. This resulted in the Statute of Autonomy of 1936, soon frustrated by Franco's coup d'etat and subsequent long dictatorship. After democracy was restored the legislature passed the Statute of Autonomy of 1981, approved in referendum and currently in force, providing Galicia with self-government. The interior of Galicia is characterized by a hilly landscape; mountain ranges rise to 2,000 m (6,600 ft) in the east and south. The coastal areas are mostly an alternate series of rías[b] and cliffs. The climate of Galicia is usually temperate and rainy, with markedly drier summers; it is usually classified as Oceanic. Its topographic and climatic conditions have made animal husbandry and farming the primary source of Galicia's wealth for most of its history, allowing for a relative high density of population. With the exception of shipbuilding and food processing, Galicia was based on a farming and fishing economy until after the mid-20th century, when it began to industrialize. In 2012, the gross domestic product at purchasing power parity was €56,000 million, with a nominal GDP per capita of €20,700. The population is largely concentrated in two main areas: from Ferrol to A Coruña in the northern coast, and in the Rías Baixas region in the southwest, including the cities of Vigo, Pontevedra, and the interior city of Santiago de Compostela. There are smaller populations around the interior cities of Lugo and Ourense. The political capital is Santiago de Compostela, in the province of A Coruña. Vigo, in the province of Pontevedra, is the most populous municipality, with 292,817 (2016), while A Coruña is the most populous city, with 215,227 (2014). Two languages are official and widely used today in Galicia: Galician and Spanish. Galician is a Romance language closely related to Portuguese, with which it shares Galician-Portuguese medieval literature, and Spanish, sometimes also referred to as Castilian, which is used throughout the country. Spanish is spoken fluently by virtually all in Galicia, and in 2013 it was reported that 51% of the Galician population used more Galician on a day-to-day, and 48% used more Spanish. The name Galicia derives from the Latin toponym Callaecia, later Gallaecia, related to the name of an ancient Celtic tribe that resided north of the Douro river, the Gallaeci or Callaeci in Latin, or Καλλαϊκoί (Kallaïkoí) in Greek. These Callaeci were the first tribe in the area to help the Lusitanians against the invading Romans. The Romans applied their name to all the other tribes in the northwest who spoke the same language and lived the same life. The etymology of the name has been studied since the 7th century by authors such as Isidore of Seville, who wrote that "Galicians are called so, because of their fair skin, as the Gauls", relating the name to the Greek word for milk. In the 21st century, some scholars have derived the name of the ancient Callaeci either from Proto-Indo-European *kal-n-eH2 'hill', through a local relational suffix -aik-, so meaning 'the hill (people)'; or either from Proto-Celtic *kallī- 'forest', so meaning 'the forest (people)'. In any case, Galicia, being per se a derivation of the ethnic name Kallaikói, means 'the land of the Galicians'. The most recent proposal comes from linguist Francesco Benozzo after identifying the root gall- / kall- in a number of Celtic words with the meaning "stone" or "rock", as follows: gall (old Irish), gal (Middle Welsh), gailleichan (Scottish Gaelic), kailhoù (Breton), galagh (Manx) and gall (Gaulish). Hence, Benozzo explains the ethnonym Callaeci as being "the stone people" or "the people of the stone" ("those who work with stones"), in reference to the builders of the ancient megaliths and stone formations so common in Galicia. 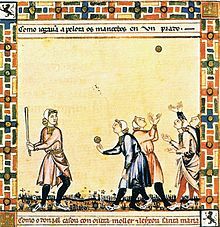 The name evolved during the Middle Ages from Gallaecia, sometimes written Galletia, to Gallicia. In the 13th century, with the written emergence of the Galician language, Galiza became the most usual written form of the name of the country, being replaced during the 15th and 16th centuries by the current form, Galicia. This coincides with the spelling of the Castilian Spanish name. The historical denomination Galiza became popular again during the end of the 19th and the first three-quarters of the 20th century, and is still used with some frequency today. The Xunta de Galicia, the local devolved government, uses Galicia. The Royal Galician Academy, the institution responsible for regulating the Galician language, whilst recognizing Galiza as a legitimate current denomination, has stated that the only official name of the country is Galicia. The oldest attestation of human presence in Galicia has been found in the Eirós Cave, in the municipality of Triacastela, which has preserved animal remains and Neanderthal stone objects from the Middle Paleolithic. The earliest culture to have left significant architectural traces is the Megalithic culture, which expanded along the western European coasts during the Neolithic and Calcolithic eras. Thousands of Megalithic tumuli are distributed throughout the country, but mostly along the coastal areas. Within each tumulus is a stone burial chamber known locally as anta (dolmen), frequently preceded by a corridor. Galicia was later influenced by the Bell Beaker culture. Its rich mineral deposits of tin and gold led to the development of Bronze Age metallurgy, and to the commerce of bronze and gold items all along the Atlantic coast of Western Europe. A shared elite culture evolved in this region during the Atlantic Bronze Age. Dating from the end of the Megalithic era, and up to the Bronze Age, numerous stone carvings (petroglyphs) are found in open air. They usually represent cup and ring marks, labyrinths, deer, Bronze Age weapons, and riding and hunting scenes. Large numbers of these stone carvings can be found in the Rías Baixas regions, at places such as Tourón and Campo Lameiro. The Castro culture ('Culture of the Castles') developed during the Iron Age, and flourished during the second half of the first millennium BC. It is usually considered a local evolution of the Atlantic Bronze Age, with later developments and influences and overlapping into the Roman era. Geographically, it corresponds to the people the Romans called Gallaeci, which were composed of a large series of nations or tribes, among them the Artabri, Bracari, Limici, Celtici, Albiones and Lemavi. They were capable fighters: Strabo described them as the most difficult foes the Romans encountered in conquering Lusitania, while Appian mentions their warlike spirit, noting that the women bore their weapons side by side with their men, frequently preferring death to captivity. According to Pomponius Mela all the inhabitants of the coastal areas were Celtic people. A local Iron Age head warrior from Rubiás, Bande. Now in Museo Provincial de Ourense. Gallaeci lived in castros. These were usually annular forts, with one or more concentric earthen or stony walls, with a trench in front of each one. They were frequently located at hills, or in seashore cliffs and peninsulas. Some well known castros can be found on the seashore at: Fazouro, Santa Tegra, Baroña, and O Neixón; and inland at: San Cibrao de Lás, Borneiro, Castromao, and Viladonga. Some other distinctive features, such as temples, baths, reservoirs, warrior statues and decorative carvings have been found associated to this culture, together with rich gold and metalworking traditions. The Roman legions first entered the area under Decimus Junius Brutus in 137–136 BC, but the country was only incorporated into the Roman Empire by the time of Augustus (29 BC – 19 BC). 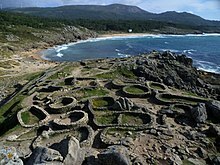 The Romans were interested in Galicia mainly for its mineral resources, most notably gold. Under Roman rule, most Galician hillforts began to be – sometimes forcibly – abandoned, and Gallaeci served frequently in the Roman army as auxiliary troops. Romans brought new technologies, new travel routes, new forms of organizing property, and a new language; Latin. The Roman Empire established its control over Galicia through camps (castra) as Aquis Querquennis, Ciadella camp or Lucus Augusti (Lugo), roads (viae) and monuments as the lighthouse known as Tower of Hercules, in Corunna, but the remoteness and lesser interest of the country since the 2nd century of our era, when the gold mines stopped being productive, led to a lesser degree of Romanization. In the 3rd century it was made a province, under the name Gallaecia, which included also northern Portugal, Asturias, and a large section of what today is known as Castile and León. 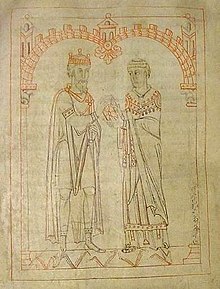 Miro, king of Galicia, and Martin of Braga, from an 1145 manuscript of Martin's Formula Vitae Honestae, now in the Austrian National Library. The original work was dedicated to King Miro with the header "To King Miro, the most glorious and calm, the pious, famous for his Catholic faith"
Later the Muslims invaded Spain (711), but the Arabs and Moors never managed to have any real control over Galicia, which was later incorporated into the expanding Christian Kingdom of Asturias, usually known as Gallaecia or Galicia (Yillīqiya and Galīsiya) by Muslim Chroniclers, as well as by many European contemporaries. This era consolidated Galicia as a Christian society which spoke a Romance language. During the next century Galician noblemen took northern Portugal, conquering Coimbra in 871, thus freeing what was considered the southernmost city of ancient Galicia. During the Peninsular War the successful uprising of the local people against the new French authorities, together with the support of the British Army, limited the occupation to a six-month period in 1808-1809. During the pre-war period the Supreme Council of the Kingdom of Galicia (Junta Suprema del Reino de Galicia), auto-proclaimed interim sovereign in 1808, was the sole government of the country and mobilized near 40,000 men against the invaders. Galicia was spared the worst of the fighting in that war: it was one of the areas where the initial coup attempt at the outset of the war was successful, and it remained in Nationalist (Franco's army's) hands throughout the war. While there were no pitched battles, there was repression and death: all political parties were abolished, as were all labor unions and Galician nationalist organizations as the Seminario de Estudos Galegos. Galicia's statute of autonomy was annulled (as were those of Catalonia and the Basque provinces once those were conquered). According to Carlos Fernández Santander, at least 4,200 people were killed either extrajudicially or after summary trials, among them republicans, communists, Galician nationalists, socialists and anarchists. Victims included the civil governors of all four Galician provinces; Juana Capdevielle, the wife of the governor of A Coruña; mayors such as Ánxel Casal of Santiago de Compostela, of the Partido Galeguista; prominent socialists such as Jaime Quintanilla in Ferrol and Emilio Martínez Garrido in Vigo; Popular Front deputies Antonio Bilbatúa, José Miñones, Díaz Villamil, Ignacio Seoane, and former deputy Heraclio Botana); soldiers who had not joined the rebellion, such as Generals Rogelio Caridad Pita and Enrique Salcedo Molinuevo and Admiral Antonio Azarola; and the founders of the PG, Alexandre Bóveda and Víctor Casas, as well as other professionals akin to republicans and nationalists, as the journalist Manuel Lustres Rivas or physician Luis Poza Pastrana. Many others were forced to escape into exile, or were victims of other reprisals and removed from their jobs and positions. General Francisco Franco — himself a Galician from Ferrol — ruled as dictator from the civil war until his death in 1975. Franco's centralizing regime suppressed any official use of the Galician language, including the use of Galician names for newborns, although its everyday oral use was not forbidden. Among the attempts at resistance were small leftist guerrilla groups such as those led by José Castro Veiga ("O Piloto") and Benigno Andrade ("Foucellas"), both of whom were ultimately captured and executed. In the 1960s, ministers such as Manuel Fraga Iribarne introduced some reforms allowing technocrats affiliated with Opus Dei to modernize administration in a way that facilitated capitalist economic development. However, for decades Galicia was largely confined to the role of a supplier of raw materials and energy to the rest of Spain, causing environmental havoc and leading to a wave of migration to Venezuela and to various parts of Europe. Fenosa, the monopolistic supplier of electricity, built hydroelectric dams, flooding many Galician river valleys. Memorial to the mayor and other republicans, including a syndicalist and a journal director, executed in Verín, June 17, 1937. As part of the transition to democracy upon the death of Franco in 1975, Galicia regained its status as an autonomous region within Spain with the Statute of Autonomy of 1981, which begins, "Galicia, historical nationality, is constituted as an Autonomous Community to access to its self-government, in agreement with the Spanish Constitution and with the present Statute (...)". Varying degrees of nationalist or independentist sentiment are evident at the political level. The Bloque Nacionalista Galego or BNG, is a conglomerate of left-wing parties and individuals that claims Galician political status as a nation. In 2009, the PSdG-BNG coalition lost the elections and the government went back to the People's Party (conservative), even though the PSdG-BNG coalition actually obtained the most votes. Alberto Núñez Feijóo (PPdG) is now Galicia's president. In 2012 several parties and individuals abandoned the BNG. Encontro Irmandiño abandoned the bloc and joined with Fronte Obreira Galega, the FPG, Movemento pola Base and other collectives to form Anova-Nationalist Brotherhood. Anova obtained 9 seats in the 2012 Galician election as part of the Galician Left Alternative coalition. BNG obtained 7 seats and PPdG won the elections again. Galicia has a surface area of 29,574 square kilometres (11,419 sq mi). Its northernmost point, at 43°47′N, is Estaca de Bares (also the northernmost point of Spain); its southernmost, at 41°49′N, is on the Portuguese border in the Baixa Limia-Serra do Xurés Natural Park. The easternmost longitude is at 6°42′W on the border between the province of Ourense and the Castilian-Leonese province of Zamora) its westernmost at 9°18′W, reached in two places: the A Nave Cape in Fisterra (also known as Finisterre), and Cape Touriñán, both in the province of A Coruña. The interior of Galicia is a hilly landscape, composed of relatively low mountain ranges, usually below 1,000 m (3,300 ft) high, without sharp peaks, rising to 2,000 m (6,600 ft) in the eastern mountains. There are many rivers, most (though not all) running down relatively gentle slopes in narrow river valleys, though at times their courses become far more rugged, as in the canyons of the Sil river, Galicia's second most important river after the Miño. Topographically, a remarkable feature of Galicia is the presence of many firth-like inlets along the coast, estuaries that were drowned with rising sea levels after the ice age. These are called rías and are divided into the smaller Rías Altas ("High Rías"), and the larger Rías Baixas ("Low Rías"). The Rías Altas include Ribadeo, Foz, Viveiro, O Barqueiro, Ortigueira, Cedeira, Ferrol, Betanzos, A Coruña, Corme e Laxe and Camariñas. The Rías Baixas, found south of Fisterra, include Corcubión, Muros e Noia, Arousa, Pontevedra and Vigo. The Rías Altas can sometimes refer only to those east of Estaca de Bares, with the others being called Rías Medias ("Intermediate Rías"). The coast of this 'green corner' of the Iberian Peninsula, some 1,500 km (930 mi) in length, attracts great numbers of tourists, although real estate development in the 2000–2010 decade have degraded it partially. The highest point in Galicia is Trevinca or Pena Trevinca (2,124 metres or 6,969 feet), located in the Serra do Eixe, at the border between Ourense and León and Zamora provinces. Other tall peaks are Pena Survia (2,112 metres or 6,929 feet) in the Serra do Eixe, O Mustallar (1,935 metres or 6,348 feet) in Os Ancares, and Cabeza de Manzaneda (1,782 metres or 5,846 feet) in Serra de Queixa, where there is a ski resort. Galicia is poetically known as the "country of the thousand rivers" ("o país dos mil ríos"). 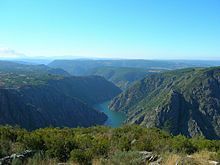 The largest and most important of these rivers is the Miño, poetically known as O Pai Miño (Father Miño), which is 307.5 km (191.1 mi) long and discharges 419 m3 (548 cu yd) per second, with its affluent the Sil, which has created a spectacular canyon. Most of the rivers in the inland are tributaries of this river system, which drains some 17,027 km2 (6,574 sq mi). Other rivers run directly into the Atlantic Ocean or the Cantabrian Sea, most of them having short courses. Only the Navia, Ulla, Tambre, and Limia have courses longer than 100 km (62 mi). Galicia's many hydroelectric dams take advantage of the steep, deep, narrow rivers and their canyons. Due to their steep course, few of Galicia's rivers are navigable, other than the lower portion of the Miño and the portions of various rivers that have been dammed into reservoirs. Some rivers are navigable by small boats in their lower reaches: this is taken great advantage of in a number of semi-aquatic festivals and pilgrimages. Deforestation and forest fires are a problem in many areas, as is the continual spread of the eucalyptus tree, a species imported from Australia, actively promoted by the paper industry since the mid-20th century. Galicia is one of the more forested areas of Spain, but the majority of Galicia's plantations, usually growing eucalyptus or pine, lack any formal management. Massive eucalyptus plantation, especially of Eucalyptus globulus , began in the Francisco Franco era, largely on behalf of the paper company Empresa Nacional de Celulosas de España (ENCE) in Pontevedra, which wanted it for its pulp. Wood products figure significantly in Galicia's economy. Apart from tree plantations Galicia is also notable for the extensive surface occupied by meadows used for animal husbandry, especially cattle, an important activity. Hydroelectric development in most rivers has been a serious concern for local conservationists during the last decades. Galicia has more than 2,800 plant species and 31 endemic plant taxons. 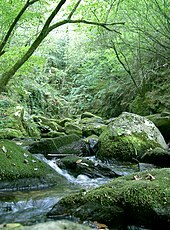 A few oak forests (variously known locally as fragas or devesas) remain, particularly in the north-central part of the province of Lugo and the north of the province of A Coruña (Fragas do Eume). Galicia has 262 inventoried species of vertebrates, including 12 species of freshwater fish, 15 amphibians, 24 reptiles, 152 birds, and 59 mammals. The animals most often thought of as being "typical" of Galicia are the livestock raised there. The Galician horse is native to the region, as is the Galician Blond cow and the domestic fowl known as the galiña de Mos. The last is an endangered species, although it is showing signs of a comeback since 2001. Galicia's woodlands and mountains are home to rabbits, hares, wild boars, and roe deer, all of which are popular with hunters. Several important bird migration routes pass through Galicia, and some of the community's relatively few environmentally protected areas are Special Protection Areas (such as on the Ría de Ribadeo) for these birds. From a domestic point of view, Galicia has been credited for author Manuel Rivas as the "land of one million cows". Galician Blond and Holstein cattle coexist on meadows and farms. Being located on the Atlantic coastline, Galicia has a very mild climate for the latitude and the marine influence affects most of the province to various degrees. In comparison to similar latitudes on the other side of the Atlantic, winters are exceptionally mild, with consistently heavy rainfall. At sea level, snow is exceptional due to temperatures just occasionally dropping below freezing. The warmest coastal station of Pontevedra has a yearly mean temperature of 14.8 °C (58.6 °F). Ourense located somewhat inland is only slightly warmer with 14.9 °C (58.8 °F). Due to its exposed north-westerly location, the climate is still very cool by Spanish standards. In coastal areas summers are temperered, with daily maximums averaging around 25 °C (77 °F) in Vigo. Temperatures are further cooler in A Coruña, with a subdued 22.8 °C (73.0 °F) normal. Temperatures do however soar in inland areas such as Ourense, where days above 30 °C (86 °F) are very regular. The lands of Galicia are ascribed to two different areas in the Köppen climate classification: a south area (roughly, the province of Ourense and Pontevedra) with tendencies to have some summer drought, classified as a warm-summer Mediterranean climate (Csb), with mild temperatures and rainfall usual throughout the year; and the western and northern coastal regions, the provinces of Lugo and A Coruña, which are characterized by their Oceanic climate (Cfb), with a more uniform precipitation distribution along the year, and milder summers. However, precipitation in southern coastal areas are often classified as oceanic since the averages remain significantly higher than a typical Mediterranean climate. As an example, Santiago de Compostela, the political capital city, has an average of 129 rainy days and 1,362 millimetres (53.6 in) per year (with just 17 rainy days in the three summer months) and 2,101 sunlight hours per year, with just 6 days with frosts per year. But the colder city of Lugo, to the east, has an average of 1,759 sunlight hours per year, 117 days with precipitations (> 1 mm) totalling 901.54 millimetres (35.5 in), and 40 days with frosts per year. The more mountainous parts of the provinces of Ourense and Lugo receive significant snowfall during the winter months. The sunniest city is Pontevedra with 2,223 sunny hours per year. The Xunta de Galicia is a collective entity with executive and administrative power. It consists of the President, a vice president, and twelve councillors. Administrative power is largely delegated to dependent bodies. 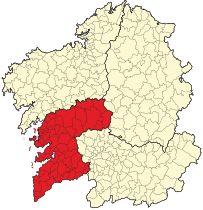 The Xunta also coordinates the activities of the provincial councils (Galician: deputacións) located in A Coruña, Pontevedra, Ourense and Lugo. There are 314 municipalities (Galician: concellos) in Galicia, each of which is run by a mayor-council government known as a concello. There is a further subdivision of local government known as an Entidade local menor; each has its own council (xunta veciñal) and mayor (alcalde da aldea). There are nine of these in Galicia: Arcos da Condesa, Bembrive, Camposancos, Chenlo, Morgadáns, Pazos de Reis, Queimadelos, Vilasobroso and Berán. In comparison to the other regions of Spain, the major economic benefit of Galicia is its fishing Industry. Galicia is a land of economic contrast. While the western coast, with its major population centers and its fishing and manufacturing industries, is prosperous and increasing in population, the rural hinterland—the provinces of Ourense and Lugo—is economically dependent on traditional agriculture, based on small landholdings called minifundios. However, the rise of tourism, sustainable forestry and organic and traditional agriculture are bringing other possibilities to the Galician economy without compromising the preservation of the natural resources and the local culture. Electric cars are made in the Citroën factory in Vigo. Galicia was late to catch the tourism boom that has swept Spain in recent decades, but the coastal regions (especially the Rías Baixas and Santiago de Compostela) are now significant tourist destinations and are especially popular with visitors from other regions in Spain, where the majority of tourists come from. In 2007, 5.7 million tourists visited Galicia, an 8% growth over the previous year, and part of a continual pattern of growth in this sector. 85% of tourists who visit Galicia visit Santiago de Compostela. Tourism constitutes 12% of Galician GDP and employs about 12% of the regional workforce. The unemployment rate stood at 15.7% in 2017 and was lower than the national average. Galicia's main airport is Santiago de Compostela Airport. Having been used by 2,083,873 passengers in 2014, it connects the Galician capital with cities in Spain as well as several major European cities. There are two other international airports in Galicia: A Coruña Airport - Alvedro and Vigo-Peinador Airport. The most important Galician fishing port is the Port of Vigo; It is one of the world's leading fishing ports, second only to Tokyo, with an annual catch worth 1,500 million euros. In 2007 the port took in 732,951 metric tons (721,375 long tons; 807,940 short tons) of fish and seafood, and about 4,000,000 metric tons (3,900,000 long tons; 4,400,000 short tons) of other cargoes. Other important ports are Ferrol, A Coruña, Marín and the smaller port of Vilagarcía de Arousa, as well as important recreational ports in Pontevedra capital city and Burela. Beyond these, Galicia has 120 other organized ports. The Galician road network includes autopistas and autovías connecting the major cities, as well as national and secondary roads to the rest of the municipalities. The Autovía A-6 connects A Coruña and Lugo to Madrid, entering Galicia at Pedrafita do Cebreiro. The Autovía A-52 connects O Porriño, Ourense and Benavente, and enters Galicia at A Gudiña. Two more autovías are under construction. Autovía A-8 enters Galicia on the Cantabrian coast, and ends in Baamonde (Lugo province). Autovía A-76 enters Galicia in Valdeorras; it is an upgrade of the existing N-120 to Ourense. Within Galicia are the Autopista AP-9 from Ferrol to Vigo and the Autopista AP-53 (also known as AG-53, because it was initially built by the Xunta de Galicia) from Santiago to Ourense. Additional roads under construction include Autovía A-54 from Santiago de Compostela to Lugo, and Autovía A-56 from Lugo to Ourense. The Xunta de Galicia has built roads connecting comarcal capitals, such as the before mentioned AG-53, Autovía AG-55 connecting A Coruña to Carballo or AG-41 connecting Pontevedra to Sanxenxo. The first railway line in Galicia was inaugurated 15 September 1873. It ran from O Carril, Vilagarcía da Arousa to Cornes, Conxo, Santiago de Compostela. A second line was inaugurated in 1875, connecting A Coruña and Lugo. In 1883, Galicia was first connected by rail to the rest of Spain, by way of O Barco de Valdeorras. Galicia today has roughly 1,100 kilometres (680 mi) of rail lines. Several 1,668 mm (5 ft 5 21⁄32 in) Iberian gauge lines operated by Adif and Renfe Operadora connect all the important Galician cities. A 1,000 mm (3 ft 3 3⁄8 in) metre gauge line operated by FEVE connects Ferrol to Ribadeo and Oviedo. A electrified line is the Ponferrada-Monforte de Lemos-Ourense-Vigo line. Several high-speed rail lines are under construction. Among these are the Olmedo-Zamora-Galicia high-speed rail line that opened partly in 2011, and the AVE Atlantic Axis route, which will connect all of the major Galician Atlantic coast cities A Coruña, Santiago de Compostela, Pontevedra and Vigo to Portugal. Another projected AVE line will connect Ourense to Pontevedra and Vigo. Galicia's inhabitants are known as Galicians (Galician: galegos, Spanish: gallegos). For well over a century Galicia has grown more slowly than the rest of Spain, due largely to a poorer economy compared with other regions of Spain and emigration to Latin America and to other parts of Spain. Sometimes Galicia has lost population in absolute terms. In 1857, Galicia had Spain's densest population and constituted 11.5% of the national population. As of 2007[update], only 6.1% of the Spanish population resided in the autonomous community. This is due to an exodus of Galician people since the 19th century, first to South America and later to Central Europe and to the development of population centers and industry in other parts of Spain. In northern Galicia, the A Coruña-Ferrol metropolitan area has become increasingly dominant in terms of population. The population of the city of A Coruña in 1900 was 43,971. The population of the rest of the province, including the City and Naval Station of nearby Ferrol and Santiago de Compostela, was 653,556. A Coruña's growth occurred after the Spanish Civil War at the same speed as other major Galician cities, but since the revival of democracy after the death of Francisco Franco, A Coruña has grown at a faster rate than all the other Galician cities. The rapid increase of population of A Coruña, Vigo and to a lesser degree other major Galician cities, like Ourense, Pontevedra or Santiago de Compostela during the years that followed the Spanish Civil War during the mid-20th century occurred as the rural population declined: many villages and hamlets of the four provinces of Galicia disappeared or nearly disappeared during the same period. Economic development and mechanization of agriculture resulted in the fields being abandoned, and most of the population moving to find jobs in the main cities. The number of people working in the Tertiary and Quaternary sectors of the economy has increased significantly. Since 1999, the absolute number of births in Galicia has been increasing. In 2006, 21,392 births were registered in Galicia, 300 more than in 2005, according to the Instituto Galego de Estatística. Since 1981, the Galician life expectancy has increased by five years, thanks to a higher quality of life. Roman Catholicism is, by far, the largest religion in Galicia. In 2012, the proportion of Galicians that identify themselves as Roman Catholic was 82.2%. The principal cities are A Coruña, Ourense, Lugo, Pontevedra, Santiago de Compostela – the political capital and archiepiscopal seat -– Vigo and Ferrol. Like many rural areas of Western Europe, Galicia's history has been defined by mass emigration. Significant internal migration took place from Galicia in the late 19th and early 20th centuries to the industrialized Spanish cities of Barcelona, Bilbao, Zaragoza and Madrid. Other Galicians emigrated to Latin America – Argentina, Uruguay, Venezuela, Mexico, Brazil and Cuba in particular. Fidel Castro was born in Cuba to a wealthy planter father who was an immigrant from Galicia; Castro's mother was of Galician descent. The two cities with the greatest number of people of Galician descent outside Galicia are Buenos Aires, Argentina, and nearby Montevideo, Uruguay. Immigration from Galicia was so significant in these areas that Argentines and Uruguayans now commonly refer to all Spaniards as gallegos (Galicians). During the Franco years, there was a new wave of emigration out of Galicia to other European countries, most notably to France, Germany, Switzerland, and the United Kingdom. Many of these immigrant or expatriate communities have their own groups or clubs, which they formed in the first decades of settling in a new place. The Galician diaspora is so widespread that websites such as Fillos de Galicia have been created in the 21st century to organize and form a network of ethnic Galicians throughout the world. Galicia has two official languages: Galician (Galician: galego) and Spanish (also known in Spain as castellano, "Castilian"), both of them Romance languages. Galician originated regionally; the latter was associated with Castile. Galician is recognized in the Statute of Autonomy of Galicia as the lingua propia ("own language") of Galicia. Galician is closely related to Portuguese. Both share a common medieval phase known as Galician-Portuguese. The independence of Portugal since the late Middle Ages has favored the divergence of the Galician and Portuguese languages as they developed. The official Galician language has been standardized by the Real Academia Galega on the basis of literary tradition. Although there are local dialects, Galician media conform to this standard form, which is also used in primary, secondary, and university education. There are more than three million Galician speakers in the world. Galician ranks in the lower orders of the 150 most widely spoken languages on earth. Since the late 20th century and the establishment of Galicia's autonomy, the Galician language is resurgent. In the cities, it is generally used as a second language for most. According to a 2001 census, 99.16 percent of the population of Galicia understood the language, 91.04 percent spoke it, 68.65 percent could read it and 57.64 percent could write it. The first two numbers (understanding and speaking) were roughly the same as responses a decade earlier. But there were great gains among the percentage of the population who could read and write Galician: a decade earlier, only 49.3 percent of the population could read Galician, and 34.85 percent could write it. During the Franco era, the teaching of Galician was prohibited. Today older people may speak the language but have no written competence because of those years. Among the regional languages of Spain, Galician has the highest percentage of speakers in its population. The earliest known document in Galician-Portuguese dates from 1228. The Foro do bo burgo do Castro Caldelas was granted by Alfonso IX of León to the town of Burgo, in Castro Caldelas, after the model of the constitutions of the town of Allariz. A distinct Galician Literature emerged during the Middle Ages: In the 13th century important contributions were made to the Romance canon in Galician-Portuguese, the most notable those by the troubadour Martín Codax, the priest Airas Nunes, King Denis of Portugal, and King Alfonso X of Castile, Alfonso O Sabio ("Alfonso the Wise"), the same monarch who began the process of establishing the hegemony of Castilian. During this period, Galician-Portuguese was considered the language of love poetry in the Iberian Romance linguistic culture. The names and memories of Codax and other popular cultural figures are well preserved in modern Galicia. Christianity is the most widely practised religion in Galicia. It was introduced in Late Antiquity and was practiced alongside the native Celtic religion for a few centuries which, incidentally, was re-established as an officially recognised religion in 2015. Still, today about 82.2% of Galicians identify as Catholic. Most Christians adhere to Roman Catholicism, though only 20% of the population described themselves as active members. 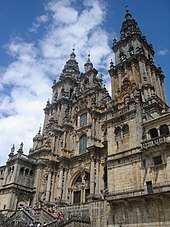 The Catholic Church in Galicia has had its primatial seat in Santiago de Compostela since the 12th century. Since the Middle Ages, the Galician Catholic Church has been organized into five ecclesiastical dioceses (Lugo, Ourense, Santiago de Compostela, Mondoñedo-Ferrol and Tui-Vigo). While these may have coincided with contemporary 15th-century civil provinces, they no longer have the same boundaries as the modern civil provincial divisions. The church is led by one archbishop and four bishops. The five dioceses of Galicia are divided among 163 districts and 3,792 parishes. A few are governed by administrators, the remainder by parish priests. The patron saint of Galicia is Saint James the Greater. According to Catholic tradition, his body was discovered in 814 near Compostela. After that date, the relics of Saint James attracted an extraordinary number of pilgrims. Since the 9th century these relics have been kept in the heart of the church – the modern-day cathedral – dedicated to him. 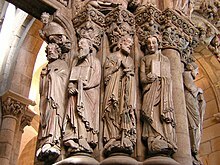 There are many other Galician and associated saints; some of the best-known are: Saint Ansurius, Saint Rudesind, Saint Mariña of Augas Santas, Saint Senorina, Trahamunda and Froilan. Galicia's education system is administered by the regional government's Ministry of Education and University Administration. 76% of Galician teenagers achieve a high school degree – ranked fifth out of the 17 autonomous communities. Romanesque façade in the Cathedral of Ourense (1160); founded in the 6th century, its construction is attributed to King Chararic. During the Middle Ages, a huge quantity of fortified castles were built by Galician feudal nobles to mark their powers against their rivals. Although the most of them were demolished during the Irmandiño Wars (1466–1469), some Galician castles that survived are Pambre, Castro Caldelas, Sobroso, Soutomaior and Monterrei among others. Ecclesiastical architecture raised early in Galicia, and the first churches and monasteries as San Pedro de Rocas, began to be built in 5th and 6th centuries. However, the most famous medieval architecture in Galicia had been using Romanesque architecture like most of Western Europe. Some of the greatest examples of Romanesque churches in Galicia are the Cathedral of Santiago de Compostela, the Ourense Cathedral, Saint John of Caaveiro, Our Lady Mary of Cambre and the Church of San Xoán of Portomarín among others. Galician cuisine often uses fish and shellfish. The empanada is a meat or fish pie, with a bread-like base, top and crust with the meat or fish filling usually being in a tomato sauce including onions and garlic. Caldo galego is a hearty soup whose main ingredients are potatoes and a local vegetable named grelo (Broccoli rabe). The latter is also employed in Lacón con grelos, a typical carnival dish, consisting of pork shoulder boiled with grelos, potatoes and chorizo. Centolla is the equivalent of king crab. It is prepared by being boiled alive, having its main body opened like a shell, and then having its innards mixed vigorously. Another popular dish is octopus, boiled (traditionally in a copper pot) and served in a wooden plate, cut into small pieces and laced with olive oil, sea salt and pimentón (Spanish paprika). This dish is called Pulpo a la gallega or in Galician "Polbo á Feira", which roughly translates as "Galician-style Octopus". There are several regional varieties of cheese. The best-known one is the so-called tetilla, named after its breast-like shape. Other highly regarded varieties include the San Simón cheese from Vilalba and the creamy cheese produced in the Arzúa-Ulloa area. A classical is filloas, crêpe-like pancakes made with flour, broth or milk, and eggs. When cooked at a pig slaughter festival, they may also contain the animal's blood. A famous almond cake called Tarta de Santiago (St. James' cake) is a Galician sweet speciality mainly produced in Santiago de Compostela and all around Galicia. Galicia has 30 products with Denominación de orixe (D.O. ), some of them with Denominación de Orixe Protexida (D.O.P.). D.O. and D.O.P. are part of a system of regulation of quality and geographical origin among Spain's finest producers. Galicia produces a number of high-quality Galician wines, including Albariño, Ribeiro, Ribeira Sacra, Monterrei and Valdeorras. The grape varieties used are local and rarely found outside Galicia and Northern Portugal. Just as notably from Galicia comes the spirit Augardente—the name means burning water—often referred to as Orujo in Spain and internationally or as caña in Galicia. This spirit is made from the distillation of the pomace of grapes. Andrés Suárez: singer-songwriter from Ferrol, known for his poetic, insightful and often romantic lyrics. Cristina Pato: Galician bagpiper and member of Yo-Yo Ma's Silk Road Ensemble. As with many other Romance languages, Galician-Portuguese emerged as a literary language in the Middle Ages, during the 12th and 13th centuries, when a rich lyric tradition developed, followed by a minor prose tradition, whilst being the predominant language used for legal and private texts till the 15th century. However, in the face of the hegemony of Castilian Spanish, during the so-called Séculos Escuros ("Dark Centuries") from 1530 to the late 18th century, it fell from major literary or legal written use. As a literary language it was revived again during the 18th and, most notably, the 19th-century (Rexurdimento Resurgence) with such writers as Rosalía de Castro, Manuel Murguía, Manuel Leiras Pulpeiro, and Eduardo Pondal. In the 20th century, before the Spanish Civil War the Irmandades da Fala ("Brotherhood of the Language") and Grupo Nós included such writers as Vicente Risco, Ramón Cabanillas and Castelao. Public use of Galician was largely suppressed during the Franco dictatorship but has been resurgent since the restoration of democracy. Contemporary writers in Galician include Xosé Luís Méndez Ferrín, Manuel Rivas, Chus Pato, and Suso de Toro. Bonfires of Saint John, Noite de San Xoán or Noite da Queima is widely spread in all Galician territory, celebrated as a welcome to the summer solstice since the Celtic period, and Christianized in Saint John's day eve. Bonfires are believed to make meigas (malicious or fallen witches), to flee. They are particularly relevant in the city of Corunna, where it became Fiesta of National Tourist Interest of Spain. The whole city participate on making great bonfires in each district, whereas the centre of the party is located in the beaches of Riazor and Orzan, in the very city heart, where hundreds of bonfires of different sizes are lighted. Also, grilled sardines are very typical. Festa da Dorna, 24 July, in Ribeira. Founded 1948, declared a Galician Festival of Tourist Interest in 2005. Founded as a joke by a group of friends, it includes the Gran Prix de Carrilanas, a regatta of hand-made boats; the Icarus Prize for Unmotorized Flight; and a musical competition, the Canción de Tasca. Festa da Peregrina in Pontevedra. There is a bullfighting festival at the same time. Pontevedra is the only city where there is a permanent bullring. In 2015 only five corridas took place within Galicia. In addition, recent studies have stated that 92% of Galicians are firmly against bullfighting, the highest rate in Spain. Despite this, popular associations, such as Galicia Mellor Sen Touradas ("Galicia Better without Bullfights"), have blamed politicians for having no compromise in order to abolish it and have been very critical of local councils', especially those governed by the PP and PSOE, payment of subsidies for corridas. The province government of Pontevedra stopped the end of these subsidies and declared the province "free of bullfights". The province government of A Coruña approved a document supporting the abolition of these events. The most widely distributed newspaper in Galicia is La Voz de Galicia, with 12 local editions and a national edition. Other major newspapers are El Correo Gallego (Santiago de Compostela), Faro de Vigo (Vigo), Diario de Pontevedra (Pontevedra), El Progreso (Lugo), La Región (Ourense), and Galicia Hoxe – The first daily newspaper to publish exclusively in Galician. Other newspapers are Diario de Ferrol', the sports paper DxT Campeón, El Ideal Gallego from A Coruña, the Heraldo de Vivero, Atlántico Diario from Vigo and the Xornal de Galicia. Galicia has a long sporting tradition dating back to the early 20th century, when the majority of sports clubs in Spain were founded. The most popular and well-supported teams in the region are Celta Vigo and Deportivo La Coruña. When the two sides play, it is referred to as the Galician derby. Deportivo were champions of La Liga in the 1999–2000 season. SD Compostela from Santiago de Compostela and Racing Ferrol from Ferrol are two other notable clubs and they currently play in third level, but nowadays the third most important football team of Galicia is CD Lugo, currently playing in the second division of La Liga (Liga Adelante). Similarly to Catalonia and the Basque Country, the Galician Football Federation also periodically fields a national team against international opposition. This fact causes some political controversy because matches involving other national football teams different from the Spanish official national team threaten its status as the one and only national football team of the State. The policy of centralization in sport is very strong as it is systematically used as a patriotic device with which to build a symbol of the supposed unity of Spain which is actually a plurinational State. Galicia is also known for its tradition of water sports, both at sea and in rivers, sush as rowing, yachting, canoeing and surfing, in which sports is a regular winner of metals in the Olympics, currently the most notable examples are David Cal, Carlos Pérez Rial and Fernando Echavarri. In the field water sport Galician par excellence are the trainer, counting Galicia with representatives in the League of San Miguel trawlers. In recent years comes from Galicia also become a power in any triathlon in the hands of Francisco Javier Gómez Noya and Iván Raña, both world champions, and Noia being one of the best athletes in the history of the specialty. In 2006 the cyclist Oscar Pereiro, another Galician athlete, won the Tour de France after the disqualification of American Floyd Landis, snatching him the top spot on the penultimate day. Galicians are also prominent athletes in sports such as mountaineering, where Chus Lago stands out, the third woman to reach the summit of Everest without oxygen aid, whom also has the title of Snow Leopard. Since 2011, several Gaelic football teams have been set up in Galicia. The first was Fillos de Breogán (A Coruña), followed Artabros (Oleiros), Irmandinhos (A Estrada), SDG Corvos (Pontevedra), and Suebia (Santiago de Compostela) with talk of creating a Galician league. Galicia also fielded a Gaelic football side (recognised as national by the GAA) that beat Brittany in July 2012 and was reported in the Spanish nationwide press. A golden chalice enclosed in a field of azure has been the symbol of Galicia since the 13th century. Originated as a Canting arms due to the phonetic similarity between the words "chalice" and Galyce ("Galicia" in old Norman language), the first documented mention of this emblem is on the Segar's Roll, an English medieval roll of arms where are represented all the Christian kingdoms of 13th-century Europe. In following centuries, the Galician emblem was variating; diverse shapes and number of chalices (initially three and later one or five), wouldn't be until the 16th century that its number was fixed finally as one single chalice. Centuries after, a field of crosses was slowly added to the azure background, and latterly also a silver host. Since then basically the emblem of the kingdom would be kept until nowadays. The ancient flag of the Kingdom of Galicia was based mainly on its coat of arms until the 19th century. However, when in 1833 the Government of Spain decided to abolish the kingdom and divided it in four provinces, the Galician emblem as well as flag, lost its legal status and international validity. It wouldn't be until the late 19th century that some Galician intellectuals (nationalist politicians and writers) began to use a new flag as symbol a renewed national unity for Galicia. That flag, what was composed by a diagonal stripe over a white background, was designated "official flag of Galicia" in 1984, after the fall of the Franco's dictatorship. 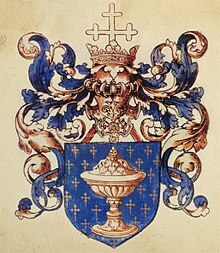 In addition, the Royal Academy of Galicia asked the Galician government to incorporate the ancient coat of arms of the kingdom onto the modern flag, being present in it since then. In addition to its coat of arms and flag, Galicia also has an own anthem. While it is true that the Kingdom of Galicia had during centuries a kind of unofficial anthem known as the "Solemn March of the kingdom", the Galician current anthem was not created until 1907, although its composition had begun already in 1880. Titled "Os Pinos" ("The Pines"), the Galician anthem lyrics was written by Eduardo Pondal, one of the greatest modern Galician poets, and its music was composed by Pascual Veiga. Performed for the first time in 1907 in Havana (Cuba) by Galician emigrants, the anthem was banned since 1927 by diverse Spanish Governments until 1977, when it was officially established by the Galician authorities. ^ These words both demonstrate the two main regional speech phenomena of the language, gheada and seseo, and are realized as [ɡaˈliθjɐ], [ɡaˈliθɐ] in the east, [ħaˈliθjɐ], [ħaˈliθɐ] more centrally, and [ħaˈlisjɐ], [ħaˈlisɐ] further west; [gaˈliθɐ], [ɡaˈliθjɐ] are de facto standard, though all of these pronunciations are considered acceptable. ^ Definition of ría: submerged valley where the sea penetrates tens of kilometres inland. ^ "Galicia", Collins English Dictionary. ^ "Instituto Galego de Estatística". Instituto Galego de Estatística. Retrieved 10 January 2017. 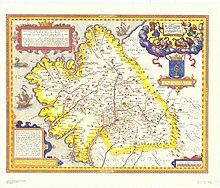 ^ Galicia had a population of 1,345,803 inhabitants in 1787, some 44 inhabitants per square kilometer, out of a total of 9,307,804 in metropolitan Spain. Cf. 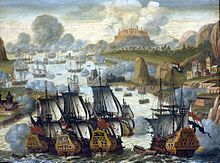 Censo español executado de orden del Rey comunicada por el ... Conde de Floridablanca en el año de 1787. Imprenta Real. 1787. Retrieved 10 January 2017. ^ Benozzo, F. (2018) "Uma paisagem atlântica pré-histórica. Etnogénese e etno-filologia paleo-mesolítica das tradições galega e portuguesa", in proceedings of Jornadas das Letras Galego-Portuguesas 2015-2017, DTS, Università di Bologna and Academia Galega da Língua Portuguesa, pp. 159-170. ^ Fraga, Xesús (8 June 2008). "La Academia contesta a la Xunta que el único topónimo oficial es Galicia" [The Academy responds to the Xunta saying that the only official toponym is Galicia]. La Voz de Galicia. Archived from the original on 4 March 2016. ^ Antonio de la Peña Santos, Los orígenes del asentamiento humano Archived 24 May 2013 at the Wayback Machine, (chapters 1 and 2 of the book Historia de Pontevedra A Coruña:Editorial Vía Láctea, 1996. p. 23. ^ Mariño Paz, Ramón (1998). Historia da lingua galega (2. ed.). Santiago de Compostela: Sotelo Blanco. p. 195. ISBN 84-7824-333-X. ^ Rubio Martínez, Amparo (2010). "LOS INGRESOS EXTRAORDINARIOS DEL REINO DE GALICIA EN EL SIGLO XV". Cuadernos de Estudios Gallegos. LVII (126): 268. Retrieved 4 July 2012. ^ "Proposición no de ley del PSdeG-PSOE en el Parlamento de Galicia sobre Memoria Histórica" (PDF). Boletín Oficial del Parlamento de Galicia (in Spanish) (262): 31146–31309. 21 December 2006. Archived from the original (PDF) on 3 April 2010. Retrieved 26 April 2010. ^ Pombo, Ernesto S. (10 March 1986). "El último guerrillero antifranquista". El País (in Spanish). Prisa. Archived from the original on 9 November 2011. Retrieved 18 February 2010. ^ Fernández, Carlos (20 October 2005). "La cárcel acogió a huéspedes históricos". La Voz de Galicia (in Spanish). Archived from the original on 2 July 2016. Retrieved 18 February 2010. ^ Portero, María José (4 March 1984). "Las huelgas más importantes". El País (in Spanish). Prisa. Archived from the original on 9 November 2011. Retrieved 2 November 2008. ^ "Muere en Ourense a los 87 años el obispo emérito de Mondoñedo Miguel Anxo Araújo". La Región (in Spanish). 23 July 2007. Archived from the original on 29 October 2013. Retrieved 3 November 2008. ^ "Asemblea urxente do Encontro Irmandiño para decidir o seu futuro no BNG". Galicia Confidencial (in Galician). 3 February 2012. Archived from the original on 4 February 2012. Retrieved 14 March 2019. ^ Europa Press (12 February 2012). "(AMP) Beiras abandona con el Encontro Irmandiño el BNG, el frente nacionalista que contribuyó a fundar en 1982". 20minutos.es (in Spanish). Retrieved 14 March 2019. ^ "Nace Anova Irmandade Nacionalista". Galicia Confidencial (in Galician). 14 July 2002. Archived from the original on 16 July 2012. Retrieved 14 March 2019. ^ Santa Maria, Inés Santa Maria (2009). Atlas Xeográfico e Histórico de Galicia e do Mundo (1. ed.). Vilaboa: Do Cumio. p. 62. ISBN 978-84-8289-328-0. ^ Enciclopedia Galega Universal (in Galician). Archived from the original on 13 July 2008. Retrieved 14 March 2019. ^ "La 'galiña de Mos' aumenta su censo de 100 a 5.500 ejemplares en siete años, aunque sigue en peligro de extinción". Europa Press (in Spanish). 21 June 2008. Retrieved 14 March 2019. ^ "Climate normals for Pontevedra". Aemet.es. Retrieved 29 December 2015. ^ "Climate normals for Ourelse". Aemet.es. Retrieved 29 December 2015. ^ "Standard climate values for Vigo". Aemet.es. Retrieved 29 December 2015. ^ "Standard climate values for A Coruña". Aemet.es. Retrieved 29 December 2015. ^ years 2006–2010, cf. the official meteorological agency Meteogalicia Archived 3 September 2015 at the Wayback Machine. ^ "Eleccións 2016". Retrieved 10 January 2017. ^ Manuel Bragado, «Microtoponimia» Archived 1 January 2016 at the Wayback Machine, Xornal de Galicia, 2005-09-05. Retrieved 2010-02-21. ^ "Zara, la marca española más conocida en el exterior". ^ a b c "Galicia recibió un 8% más de turistas durante el 2007". 2 January 2008. ^ a b EFE. "As lucenses son as que menos fillos teñen en España". Galicia-Hoxe.com. Archived from the original on 1 March 2009. Retrieved 14 March 2019. ^ "Aumentan los nacimientos en Galicia, pero el saldo vegetativo sigue negativo". galiciae.com (in Spanish). 28 May 2005. Archived from the original on 24 December 2014. Retrieved 14 March 2019. ^ Punzón, Carlos (29 October 2007). "La esperanza de vida se incrementó en Galicia en cinco años desde 1981". La Voz de Galicia (in Spanish). Archived from the original on 12 December 2009. Retrieved 29 November 2008. ^ "Indicadores Demográficos Básicos". Instituto Nacional de Estadística (in Spanish). Archived from the original on 15 October 2015. Retrieved 14 March 2019. ^ a b Nafría, Ismael (2 April 2015). "Interactivo: Creencias y prácticas religiosas en España". La Vanguardia (in Spanish). Retrieved 14 March 2019. ^ "Gallegos". Real Academia Espanola (in Spanish). Archived from the original on 26 December 2007. Retrieved 14 March 2019. ^ "Explotación estadística del Padrón". Instituto Nacional de Estadística (in Spanish). Archived from the original on 12 January 2008. ^ a b Plano Xeral de Normalización da lingua galega Archived 15 February 2010 at the Wayback Machine, Xunta de Galicia. (In Galician.) p. 38. ^ Denominaciones de Origen y Indicaciones Geográficas Archived 22 April 2010 at the Wayback Machine, Ministerio de Medio Ambiente y Medio Rural y Marino. Select "Galicia" in the dropdown. Retrieved 2010-02-22. ^ "El San Froilán atrajo a Lugo a más de un millón de personas". El Progreso (in Spanish). 13 October 2008. Archived from the original on 17 October 2009. Retrieved 26 April 2010. ^ Pardo, Miguel (24 August 2015). "A teima en Triacastela non evita o esmorecemento das touradas en Galicia". Praza Pública (in Galician). Retrieved 14 March 2019. ^ "A Deputación declara Pontevedra libre de touradas e dá outro paso para a abolición en Galicia". Praza Pública (in Galician). 26 September 2015. Retrieved 14 March 2019. ^ "A Deputación da Coruña pide por ampla maioría a abolición das touradas". Praza Pública (in Galician). 11 September 2015. Retrieved 14 March 2019. ^ "Artigo aparecido no "Faro de Vigo" (edição Ponte Vedra) no 24/10/2012. Agradece-se imenso e aguardamos que atraia muitos e muitas jogadores e jogadoras, embora há que matizar que: - A primeira foto mostra o treino inaugural da 'Suévia' de Compostela, onde participaram alguns/algumas membros dos 'Corvos' e 'Fillos de Breogán' (de facto, a primeira equipa de futebol gaélico na Galiza). - A segunda foto é do jogo entre a Galiza e a Bretanha (Breizh), não Grã Bretanha. - Em nenhum momento se falou duma liga na comarca, mas duma hipotética (e desejada) liga nacional galega se algum dia houver equipas avondo, a organizar entre todas. - Em nenhum momento se falou de "precisar" as instituições (tão só uma referência a uma solicitude de campo mal sucedida, sem mais). - Em nenhum momento Xoán falou em espanhol, sendo as suas palavras traduzidas". Faro de Vigo (in Spanish). 24 October 2012. Archived from the original on 1 January 2016. Retrieved 14 March 2019 – via Facebook. ^ Ríos, Raúl (14 August 2012). "Galicia juega al fútbol irlandés". El País. Santiago de Compostela: Prisa. Retrieved 14 May 2014. ^ "Galicia Peak". SCAR Composite Antarctic Gazetteer.